GCMA believes that the real estate in the premier markets of the United States, particularly within the Washington, DC metropolitan region which includes the Capitol Area Regional Center, will support substantial investment by GCMA managed Funds in numerous development and re-development projects. As a result, GCMA is targeting development and re-development opportunities that have attractive risk-reward characteristics and that meet its core investment requirements. 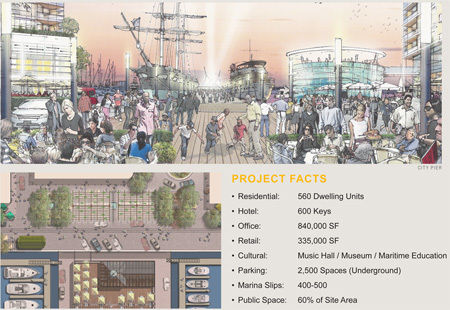 One example of a development project that if successfully developed would meet our investment criteria is The Wharf, a planned $1.2 billion redevelopment of the SW Waterfront in Washington, DC. Covering nearly 1 mile of the Potomac River waterfront. When completed, The Wharf will create an accessible, lively neighborhood on the City's waterfront- alive with people, activity, commerce, culture and recreation. Location: 27 acres of contiguous land and 24 acres of water rights along 1 mile of waterfront between the historic Fish Market and Arena Stage in SW Washington, DC.